Welcome to 509 Pine, a MODERN home with clean lines and an OPEN FLOOR PLAN. In 2015 the home was GUTTED and REMODELED like a phoenix rising from the fire. Inside and out, almost everything about the home is 3 YEARS OLD or less- the roof, the ac, the TANKLESS WATER HEATER,the plumbing, the electrical, lighting fixtures, plumbing fixtures flooring, walls, windows, doors, kitchen and baths. The exterior covering was upgraded to HARDIE BOARD (cement siding), known to withstand damage from season changes, storms and UV rays better than wood or vinyl. The home is equipped with a Vivint SECURITY SYSTEM, camera, locks and SMART THERMOSTAT, which you can control from Vivint app. (Owner will pay the transfer fee on a 24 month contract and the first few months of service)Active monitoring which provides a discount on homeowners insurance. When you enter the home, you'll notice upgraded SPANISH PORCELAIN tile in the entry. There are warm HAND-SCRAPED BAMBOO floors throughout the first floor. FRENCH DOOR that leads out to the new concrete porch and SKYLIGHTS in the living area let in so much extra light. The windows are tilt in and the custom blinds stay. Just imagine, with all this WALL SPACE, what kind of amazing artwork you can display. As you walk past the French doors, you'll be blown away by the kitchen. There are custom CONCRETE COUNTERTOPS and kitchen sink (just finished in September), SOFT CLOSE cabinets and a custom BUILT-IN BAR area. The one of a kind Louisville landmark backsplash was added along with custom photo tiles created by Nashville Artist, DayNa. Just off of the kitchen you'll find the laundry area (washer and dryer stay) and a built in desk. There is a bedroom and full bath downstairs if you need a 1st floor master. The owners added an upgraded CEDAR BARN DOOR to the bathroom. The bathroom has a full TILE SHOWER/TUB and extra storage for linens and toiletries. As you head upstairs you'll see glimpses of the original 118 year old hardwood floors and wood beams. Once upstairs you'll find a large bedroom with an amazing bathroom. There's a large WALK-IN SHOWER behind a GLASS PARTITION, with a RAIN SHOWER HEAD. The owners upgraded the carpet that was in the bedroom to custom HARDWOOD FLOORS to blend with the original floor. The blinds in the home are cordless custom blinds. And last but not least, the OVERSIZED BACKYARD is a peaceful retreat from the city. There's a COPPER FIRE PIT, stone walkway, hand built picnic table and cool vintage chairs to hang out on. The sellers also added a FULL CEDAR PRIVACY FENCE and a 30x19 PARKING PAD in the back(even the biggest car can fit). 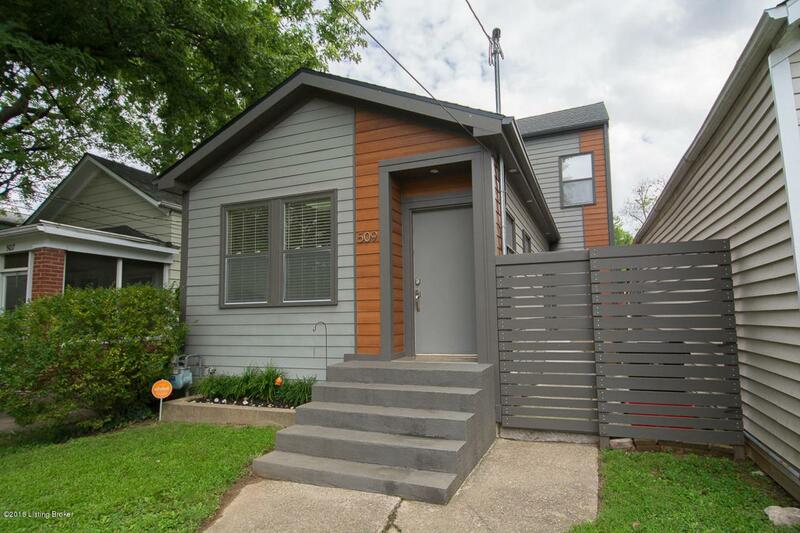 Great central location minutes from NuLu, Butchertown, the Highlands, Baxter corridor and Downtown.If you're looking for a move in ready, contemporary home, look no further! Schedule your showing today! Listing provided courtesy of Louisville Real Estate Pros. © 2019 Metro Search, Inc. All rights reserved.